DeepSoul: Average White Band - "Schoolboy Crush"
The Average White Band took listeners to school in their 1975 funk classic. Proving that true soul crosses all borders, nationalities, and races, the Average White Band stunned listeners with their relentlessly funky beats and improbably Scottish roots. While "Pick Up the Pieces" and "Cut the Cake" rank as their biggest 70s hits, "School Boy Crush" gained favor with DJs who appreciated its tight drum and bass-driven rhythm. That sound, along with its winking lyrics, make the track a standout to this day. Despite the song's upbeat tone, "School Boy Crush" was recorded during a tumultuous time for the band. Formed in the late 1960s, the original lineup (singer/bassist Alan Gorrie, guitarists Hamish Stuart and Onnie McIntyre, tenor saxophonist Malcolm Duncan, keyboardist/saxophonist Roger Ball, and drummer Robbie McIntosh) channeled their mutual love of R&B into producing funk and soul sounding straight from Philadelphia or Detroit. The Scottish band released their first album in 1973 to little notice, but their followup, AWB, spawned the number one hit "Pick Up the Pieces." 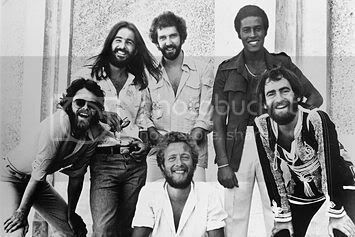 While the Average White Band was riding the initial wave of success, McIntosh died of a heroin overdose in 1974. Grieving but determined, the group carried on with another drummer, Steve Ferrone, the first African-American member of the band. Their third album, Cut the Cake, showed that the artists had lost none of their affection for soul, churning out three hits: the title track, "If I Ever Lose This Heaven, and "School Boy Crush." "School Boy Crush" remains a tour de force for the Scottish musicians; its aforementioned tight beat and popping bass lines render the tune instantly recognizable. The right-out-of-Memphis horns blare at the chorus, emphasizing the narrator's frustration with his secret crush. Another crucial ingredient is the playful lyrics, adding a healthy dose of innuendo to the proceedings. Singers Gorrie and Stuart clearly enjoy dramatizing the flirtatious interactions: "Meet me in the playground at a quarter to four/Wait till everybody's long gone/There might be some things we could explore," one croons. But the object of his affection initially has none of it: "She said, 'Look boy, but don't you touch'/That ain't much, it's only a school boy crush." The student-teacher metaphor continues, dramatizing the back-and-forth banter between the pair. Toward the track's end, the melody slightly changes to imitate a childlike tune; "ABCDEFG, won't someone talk to me...1234567, all good children go to heaven," Gorrie and Stuart vocalize in a singsong way, complete with a taunting whistle in the background. Similar to the Jackson Five's "ABC," the lyrics and tune juxtapose youthful, first-blushes of puppy love with decidedly grown up emotions. Obviously the Average White Band employs more sexual innuendo than does the angel-voiced Michael Jackson, but the contrast between childlike and mature longings are still there. Since its 1975 release, "School Boy Crush" has been sampled by various hip-hop artists, including Nas, Eric B. & Rakim, Public Enemy, De La Soul, and even Janet Jackson. This trend hardly surprises, as the tune's iconic beat provides a perfect soundtrack for rapping and singing. But the original version stands as one of the funkiest tracks ever to emerge from the 1970s, performed by a band who defied stereotypes. YouTube offers various clips of "School Boy Crush," from the original version to an Average White Band Soul Train appearance from 1975. The video below is culled from a recent House of Blues concert, showing that although few original members remain (except for Gorrie and McIntyre), the group continues to entertain fans, and can still lay down a tight groove.